Jennifer Lopez JLove perfume, a fruity floral fragrance for women launched in October 2013, is JLo's 20th celebrity perfume. The sensual and stylish scent created by perfumer Honorine Blanc includes notes of white raspberry, coconut orchid, and vanilla sorbet and is available in EDP (1.7oz/$49, 1oz/$39) at Kohl's. Celebrity fragrance ad campaign features Jennifer Lopez photographed by Mario Testino. Jennifer Lopez started her celebrity fragrance line with perfume powerhouse Coty, Inc. back in 2002 with the launch of her first celebrity perfume Glow by JLo which earned $100 million in sales during its first year. In over 10 years of working together with Coty, Lopez has created 20 perfumes that have netted retail market sales of nearly $2 billion, and have sold in over 25 countries worldwide. This fall the singer, actress, and business mogul Jennifer Lopez will launch her 20th celebrity perfume, JLove, a combination of her nickname JLo and the word Love, "because it encompasses everything about me in one simple little word." Working in collaboration with Coty, Jennifer Lopez's newest fragrance JLove was created by perfumer Honorine Blanc who blended perfume notes of raspberry, pineapple, grapefruit and tangerine into the fruity citrus top which fades into a floral middle featuring coconut orchid, lily and Tahitian tiare flowers, and finally dries down into a musk base with vanilla folded in with white woods. The square glass perfume bottle features a peach colored juice, with a dark peach font and spray nozzle. The square glass perfume bottle cap has a leopard print. The perfume advertisement campaign features Jennifer Lopez with a wildly fierce look wearing a white fur jacket with the leopard-styled perfume bottle. The fragrance campaign, shot by famed photographer Mario Testino, features the fabulous Jennifer Lopez in old throwback Hollywood glamour style. JLove perfume will launch in October 2013 at Kohl's in eau de parfum spray. Along with her perfume business partnership with Coty, Jennifer Lopez is in her 2nd year working with Kohl's department store showcasing her celebrity inspired clothing, accessory, and home decor line. 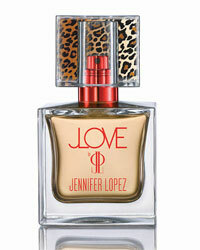 JLo's 20th celebrity perfume, JLove fragrance bottle features everything the singer loves, clean lines, animal prints, and fur. You can find the new fruity floral fragrance at Kohl's for $39-$49 for 1oz-1.7oz eau de parfum spray. The glamorous Puerto Rican singer-actress, Jennifer Lopez 44, was ranked number 12 on Forbes' 2013 "The World's Most Powerful Celebrities" list (ranked number 1 in 2012). She will return to acting as a cast member of The Boy Next Door. JLo will also return as a judge on American Idol this year, for a salary of $17.5 million, and will work along with Keith Urban, returning for a second season, and new player Harry Connick Jr. on the judge panel. Lopez was an judge in season 10 and 11, and is confirmed to return for season 13 American Idol. FOX hopes to revive the show with JLo's return and new judge Connick Jr., which has been losing to new show's like The Voice.